Please arrive at the theatre early enough to give yourself ample time to find parking. We recommend that you arrive at least 30 minutes prior to curtain to insure you can find parking, pick up your tickets at will call if necessary, use the facilities, and enjoy a refreshment before the show. Parking lots are located adjacent to the theatre. 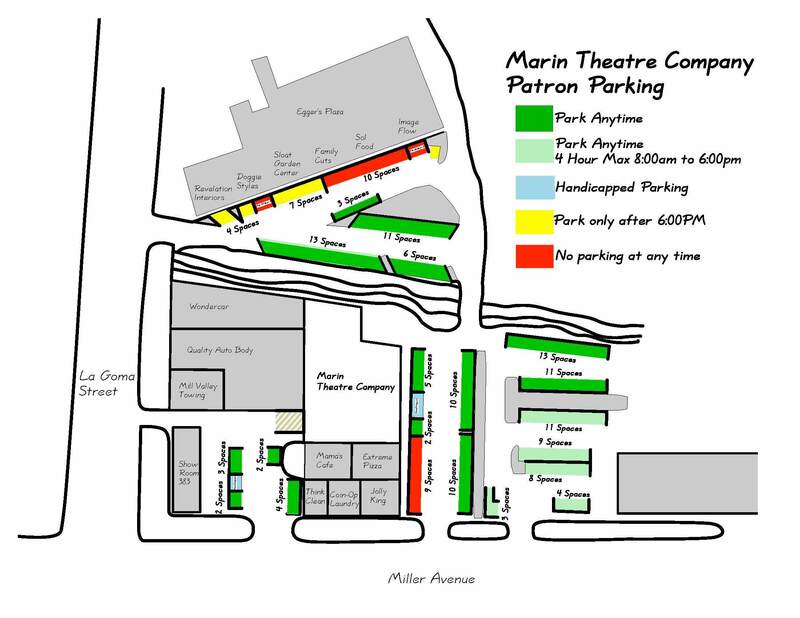 In addition to MTC’s parking lot immediately adjacent to the theatre and the City parking lot next to it, parking is available in the shopping center lot across the creek from the theatre. PLEASE NOTE: By agreement with the owners of the shopping center across the creek, MTC patrons may NOT park directly in front of businesses during business hours. Sol Foods is open in the evening and reserves the 10 spaces closest to its entrance for its patrons at all times. All other parking in the lot across the creek is available to MTC patrons. If the theatre, City and shopping center lots are full, free street parking is available on Miller Avenue and on neighborhood streets off Miller Avenue. We also encourage Mill Vallians to carpool, ride a bike or walk, if able! The 17 (Marin Transit) bus also stops on Miller Avenue very close to the theatre. Here is the 17 bus schedule. More info on public transportation and getting to the theatre here.